According to Thomas Aquinas, the Eucharist is meant to build up the unity of the church. This desired ecclesial unity is, however, not often given adequate treatment. In Speaking with Aquinas, David Farina Turnbloom seeks to describe the relationship between the celebration of the Eucharist and the unity of the church. By examining Aquinas's treatment of grace and virtues, this book allows the reader to understand Aquinas's eucharistic theology within the context of the spiritual life of the church. In the end, Turnbloom retrieves a Thomistic theology of the Eucharist that arises from Aquinas's concern for the virtuous life of the church, rather than a eucharistic theology that too narrowly focuses on theories of transubstantiation. David Farina Turnbloom is assistant professor of theology at the University of Portland. He has published numerous articles focusing on the relationships between Christian worship and ethics. He is a board member of the ecumenical group The Liturgical Conference. He holds a PhD in systematic theology from Boston College. "Many elements of his work will facilitate conversation among even the most entrenched parties on either side, namely, those who would absolutize scholastic grammars of the sacraments, and those who would do likewise to modern grammars, such as those grounded in patristics, anthropology, or studies of symbols." "Turnbloom provides a comprehensive understanding of the Eucharist while allowing Aquinas's work to be given a place that is extremely helpful to Christianity as a whole rather than getting bogged down"
"David Turnbloom invites us into an entirely new conversation about how the Eucharist nourishes our moral lives. Into the circle of contemporary theologians like Chauvet, Morrill, and Baldovin, Turnbloom invites Thomas Aquinas and gives him room to speak about his grammar of grace and virtue. As Turnbloom channels Thomas, we hear the thirteenth-century theologian with a whole new voice speaking to us about the spiritual life of friendship with God as a pilgrim community. Refreshingly satisfying discourse for hungry Christians on the move!" "By retrieving Aquinas' own understanding of grace and virtue, and the underlying principles of theosis, Turnbloom shows that there is not necessarily a deficit in Aquinas so much as in the interpretation of his work. Turnbloom also makes a strong case for the importance of virtues of charity and prudence in constructing `right' acts of religion today, perhaps offering a rejoinder to the more aggressive elements on both sides of current liturgical debates." 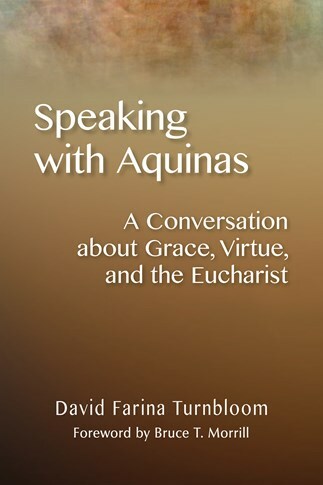 "Lucid, compelling, and conversational, David Farina Turnbloom's Speaking with Aquinas connects the sacramental theology of the Summa Theologica with Thomas Aquinas's soteriology and ethics. By examining the relationship between grace and the virtues, Turnbloom uncovers the presuppositions of Thomas Aquinas's treatises on the sacraments and on the Eucharist. Aquinas's `multiple grammars' allow him to treat the paradoxical agency of both Christ and the Christian in the sacraments. As a result, in this nuanced but accessible treatment, the Holy Spirit and the Christian life of faith emerge as the center of Aquinas's sacramental theology. Speaking with Aquinas reveals the links between Christology, sacrament, the Eucharist, and ethics, showing how Aquinas's sacramental soteriology can still speak to readers today." "An ambitious project, but quite a necessary one. Turnbloom's attempt to build a dialogue between different aspects of Aquinas's thought and bring it into a more recent kind of liturgical theology is admirable. The author's writing is accessible to the ordinary reader who might not be familiar with Thomistic theology."